I'm so excited to share today's post because I get to share my new favorite t-shirt! A few months ago at Con of Thrones I met a fellow Red Viper of Dorne, Chuck. Turns out this Prince Oberyn has an awesome nerdy business. Chuck is actually the creator of the online store Fanamaniacs. Seldom is being a geek contained to enjoying one single fandom. That's why I am so appreciative of awesome designs like the ones on Fanamaniacs. Chuck effortlessly joins fandoms to create designs any nerd would love to wear, I mean Grainger Things? Count me in. One of my favorite feelings in the world is going to conventions and recognizing that there's countless others just as passionate about my favorite fictional world as I am. That feeling of "hey no way I love that character too" or "no way same, they're my otp" really warms my heart. Having an instant connection with another person, even if it's over fiction, always has a positive impact on my mood and spirit. That feeling of mutual appreciation I find at conventions is definitely the feeling I get when scrolling through Chuck's designs. I love how being a geek can not only mean celebrating beloved fictional realms, but celebrating each other. You see, I don't just love these shirts because they proclaim my geekery, but because they proclaim the awesomeness of the people who love this geekery too. This feeling is quite similar to my appreciation for meeting creative people in my area. Meeting creative people within the nerdy world is like a warm hug. How? I've come to realize that recognizing the effort and talent of others is ultimately beneficial for myself as well. It feels like a gift to be able to support another's creativity. So really it's no wonder that I appreciate fellow geeks like Chuck so much. Sharing in on the creative process while recognizing a love for the greater nerd good gives me a rare kind of joy. 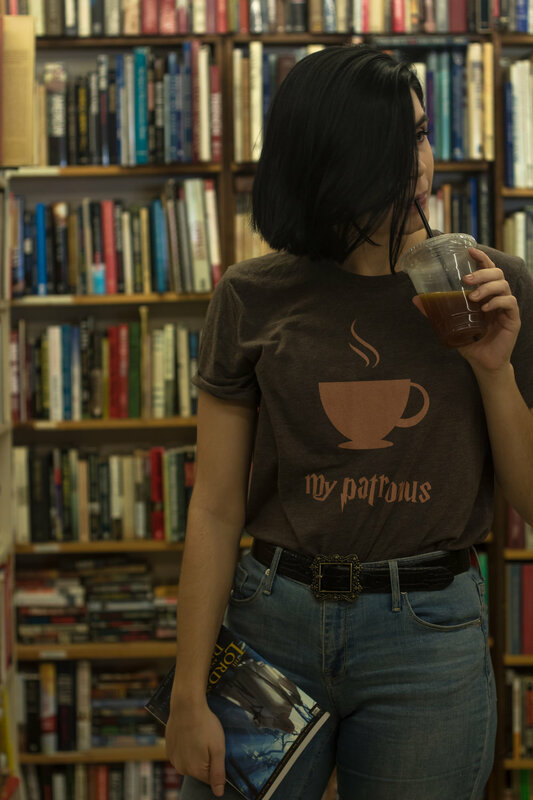 In today's photos I'm modeling my favorite t-shirt from Fanamaniacs because you know coffee and Harry Potter, how could it possibly get better? I have to thank the lovely Miss Melanie Cusick for these photos. This is my second time shooting with her and we had so much fun walking around this bookstore in Raleigh! Melanie actually did a spooky shoot for Halloween that I'm in love with and you should definitely go check it out on her Instagram. Until next week, mischief managed.